Krotos Audio, the company behind the innovative Dehumaniser, Reformer and Weaponiser product range have announced the new and improved Reformer Pro. With this new version, Krotos Audio are aiming to give sound designers and producers the tools to design, automate and perform any sound effect in real-time, without having to be shackled to a mouse and keyboard. The big new feature in Reformer Pro is the company’s Dynamic Input technology — a world first, they claim. According to Krotos Audio, this allows you to create dynamic sound design without an audio input, use automation or MIDI to control your libraries, and trigger transients directly, based on frequency via velocity-sensitive MIDI input. ‘Continuous mode’ is designed to help you add variation quickly and easily and create constantly evolving sounds that are suitable for environmental effects or electronic textures. When combined with the new Extended Library View, Krotos say that this presents a comprehensive range of results from a single library. 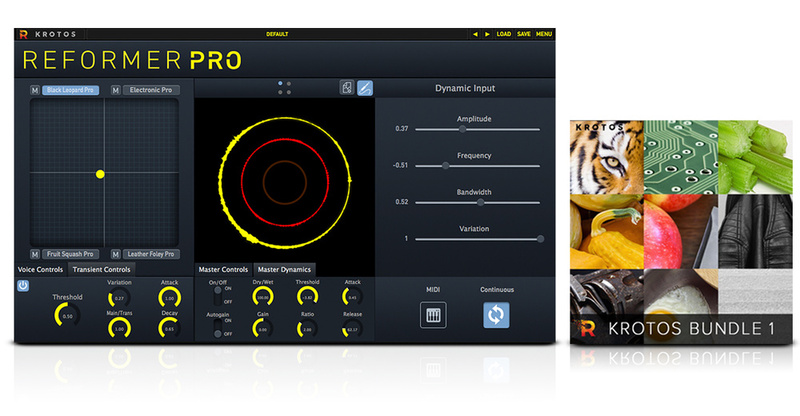 Although Reformer Pro’s innovative Analysis Tool lets users analyse their own sound libraries, Krotos has also released a growing collection of custom sound effects libraries, partnering with the likes of BOOM Library and SoundBitsto make over 100 libraries categorised into Animals, Electronic, Foley, Mechanical, Sound Design and Bundle options. Also new for Reformer Pro, is the Transient Engine which allows you to perform impacts and drum hits with a live audio input in real-time or any audio file in your DAW. Designed to add extra definition, you can layer multiple transients using two or more voices, trigger transients based on amplitude threshold and response. You can also mix between transient and ‘classic’ Reformer Pro engines, control transient playback using attack and release, and use the Extended Library View to select/deselect transient material from a library. Two new library expansions have been added, too. The new ‘Electronics Bundle’ and ‘Water Bundle’ available to purchase via the Reformer Library Bundles page. And, of course, there are various useful workflow improvements and under-the-hood enhancements for improved audio processing quality. Reformer Pro is available now for £335$399. You can get a 10-day free trial if you have an iLok account.